ChapStick, famous for its lip balms, has been used by my family for years. I, as well as my teenage girls, like to wear ChapStick to keep our lips from chapping and to leave them moisturized. 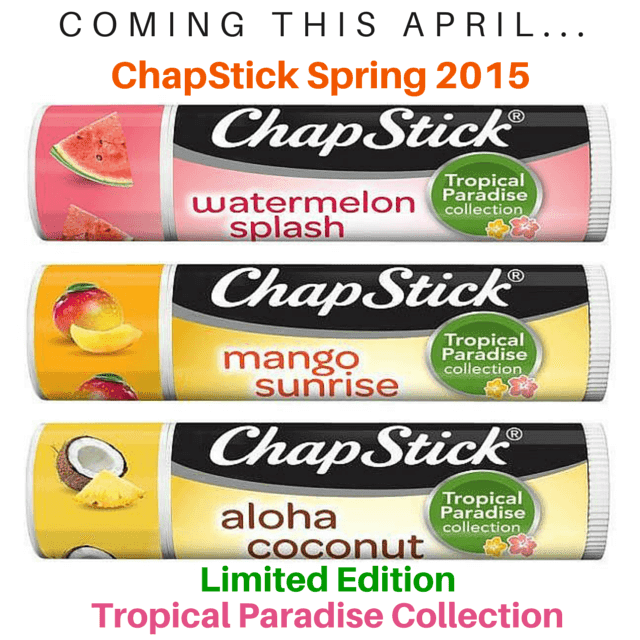 ChapStick is already a tried and true brand in my household, and I was delighted to learn the company has come out with a limited edition Tropical Paradise Collection. The collection of three graphically-printed lip balms brings the exotic taste of the islands to your lips. This new assortment features three fresh fruit flavors - Watermelon Splash, Mango Sunrise, and Aloha Coconut. Each of the three leaves a fresh fruit taste that closely matches what the flavor indicates. Although I like all the Tropical Paradise flavors, my favorite of the three is Watermelon Splash. All three flavors will be available for a limited time beginning in April 2015. ChapStick Aloha Coconut will be available exclusively at Walmart, while the other two flavors will be available at mass retailers and drug stores nationwide. We'll definitely be purchasing more to use while they are available to keep our lips feeling smooth and healthy. Which flavor from the ChapStick Tropical Paradise Collection would you be most likely to purchase - Aloha Coconut, Watermelon Splash, or Mango Sunrise? The ChapStick® products and information have been provided by Pfizer Consumer Healthcare. The opinions within this post are of my own and I was not influenced in any way. Please do your own research before purchasing products or using services. Your opinions and results may differ. That coconut flavor looks like something I would like. Watermelon Splash sounds really good! I can't wait to try the Mango Sunrise. Id like to try the watermelon splash. Ive been using chapstick since I was a kid.